A perfect Mate for the Female Head Planter. This coated terracotta planter, has an aged finish and will lend a classic sophistication to any garden. I've had so much fun planting these very unique planters and they really are a huge conversation piece. So many different plants can be used and basically the "sky is the limit!" (plants are not included) They really do add personality to a garden! I have several other pieces available in this collection - Urns, planters, pedestals and heads. 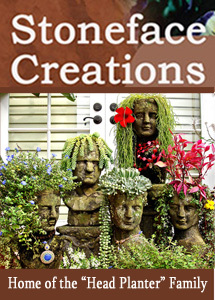 This is an incredible line of garden statuary and containers - Look in your high-end catalogs, you'll find comparable items at twice the price. Currently, I accept Paypal as well as Visa or Mastercard and details will be provided as per C-Mail. In order to provide sales receipts and fedex tracking I also request your Email address. Ordering 2 saves quite a bit in shipping as I can package them together. I currently have quite a few in stock, but with spring on it's way sales have been brisk! Size: 12" X 9" X 19"
If you are interested in purchasing this item, please C-Mail me with your zip code/quantity desired and I will provide a personalized shipping quote. He's quite a hit with the ladies! I am trying to order a female , can you message me please!